I hope you have all had a lovely Christmas and hopefully had more time off than myself. No partying for me on New Years Eve either as I am working till 8pm. Will look forward to getting home and relaxing with hubby and a glass or two of Red wine to see the new year in. I am sharing with you today my first mixed media project. I really enjoyed making this and I have another to show you soon. I started by covering the hearts with Gesso and when this was dry I added the flowers and bricks using structure paste through the stencils. I used Lindy's stamp gang sprays in Angelic Christmas and Marion Smith colour lab starter kit to colour the flowers and hearts. I used two leaves from Noor Design which are listed below. I hope you have enjoyed looking at my project - I will see you soon for my next mixed media project..
Have a lovely New Year whether you are sharing it with family or friends or like us, having a quiet evening. I hope you all have a happy and healthy 2016. I hope you spent some wonderful and happy Christmas days. I enjoyed some days off and am a bit sad that the most magical time of the year is past again. I am already back at work today, but some more days off ahead over New Year... yeah!! Today I want to show you my project made with the fun Dutch Doobadoo Card Art Phone. I wanted to make kind of a drawer with it and I really am happy with how it turned out. The coloring of the image is made with Distress Inks. Thank you for looking. I wish you a happy day now! Hi everyone, a real quick share today. 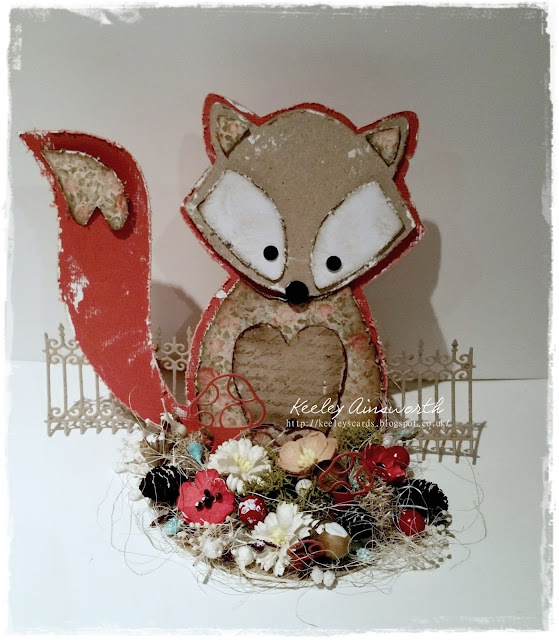 I have used the Card Art A4 Fox template, I cut him out in co-ordination card. Surrounding him in his own little forest, followed with a ornate fence. Thank you popping by today, see you all in 2016. Hello and good morning everyone, today I want to show you my personal favorite Christmas card I made this season. I so love the shape of the Dutch Doobadoo Card Art Snowglobe. It's fun to create with it. Now I wish everyone a Merry Christmas! I hope you are all well and looking forward to Christmas. I have closed my craft room doors for a week as I have so much to do at home. I am sharing with you today a non traditional Christmas Card. I was actually going to put butterflies on it but I thought that was a bit too un-Christmassy. The gorgeous pink papers are taken from the With Love paper pad. They are truly gorgeous and the main reason I chose to do a pink Christmas card. Various leaves have been added including the Vintage flourish leaf with hearts, flourish Holly leaf and the large leaf die. I have used the large heart with butterfly die (not used the butterfly) and the flower above is from the 0459 cutting and embossing flower frame. I would like to wish you all a very Happy Christmas. See you next week with my first mixed media project..
A Gift for the Bride! Dutch Doobadoo Swing card art.